What are the Duties of Corporate Board Officers? One of the first tasks in starting a corporation is to set up a corporate board of directors. The top three corporate officers are the president/chairman of the board, corporate treasurer, and corporate secretary, and we will focus on these individuals. These individuals will guide the corporation through startup and operations, and they have overall responsibility for the operation of the corporation. In general, the responsibilities of the board of directors include fiduciary responsibility for the financial well-being of the corporation, responsibility to set the mission and vision of the company, and oversight in setting policy and reviewing actions of employees. 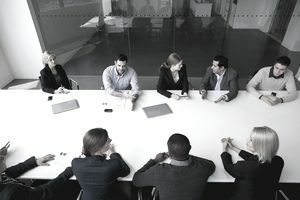 In their roles as board members, the board as a whole also has a fiduciary duty to the shareholders, to assure that the corporation is profitable, as much as possible. Of course, profitability must be balanced with other duties of board members. The board as a whole, individual board members, and board officers in their positions can be sued for breach of fiduciary responsibility. One common breach is conflict of interest: putting the interest of the board member ahead of that of the company. A specific type of conflict comes when a board member profits from a transaction approved by the board. For example, if a business owned by a board member or a relative of the member gains a lucrative contract approved by the board treasurer. Officers of corporations, as you will see, have specific duties relating to the overall board of directors duties. In smaller businesses, it is often the case that administrative duties are taken up by board officers. In this case, the liability of the individual is increased. For example, a corporate treasurer, whose duties are restricted to oversight and policy, as described below, may also take on day-to-day financial responsibilities for paying bills and taxes. Wearing an executive employee hat may be necessary, but be aware that the day-to-day duties subject the individual to different types of liabilities. If payroll taxes are not paid, the corporate treasurer who had the responsibility to see that those taxes were paid may be held personally liable for the non-payment of those taxes. It's important to understand corporate board liability as you select and run your corporation. The vice president of a corporation may have no specific duties but should be able to fill the duties of president if required. Often, the vice president chairs specific committees or has other regular duties, as determined by the board in its bylaws or on an ad-hoc basis. Record minutes of all board meetings and minutes of all committees as needed. Minutes must be taken in a specific form and all board and committee actions must be recorded. Keep records of all policies approved by the board. Maintain a calendar of corporate events, including the date of the annual meeting and budget approval dates. Maintain personnel and payroll records for executive employees reporting directly to the board of directors. Keep all records in a safe place and make sure all documents are in good order in case of audits. Creating and maintaining the corporation's annual budget for each fiscal (financial) year. This responsibility includes presenting the budget to the board for approval. Creating, implementing and reviewing financial policies for the corporation. Overseeing the annual financial audit of the corporation (if public) and other audits of corporate records and finances.